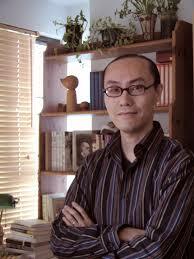 For the novelist Dung Kai-Cheung, Hong Kong is not China. Twenty years already and many questions for the future. It was in 1997 that the sovereignty of Hong Kong was transferred to China. On the occasion of this anniversary, the publisher Penguin has released a series of seven books on Hong Kong, its history, economy, politics. Literature is not forgotten with “Dear Hong Kong” by Xu Xi and especially “Cantonese love stories” (1) by Dung Kai-Cheung, the most important writer, multiple prizes winner but little known outside the territory. We have in mind quite a few novels set in Hong Kong, generally written by foreigners (“Tai-Pan”, “Multiple splendour”, “The world of Suzie Wong” …). In China everyone knows the fabulous wuxia novels of the phenomenon Jin Wong. But it is not to these that Dung Kai-Cheung refers when he speaks of Hong Kong novelists; he quotes Leung Ping-Kwan, Xi Xi and Liu Yichang who are rarely translated. His novels, short stories and essays, numerous and sometimes of an imposing size (specially the “Trilogy of natural history”), are not to be listed, especially since few works are translated into French with the exception of short stories by Annie Curien (2). But recently, the excellent journal “Jentayu” with Gwennaël Gaffric, published seven chapters of “Atlas”. 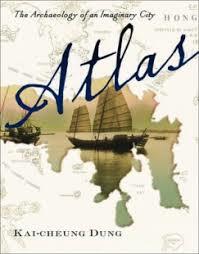 In English translation, “Atlas” was published in 2002 in the prestigious Columbia series thanks to the recommendations by David Der -Wei Wang, professor at Harvard. And a few months ago was released “Cantonese love stories”, translated as “Atlas” by Bonnie S. MacDougall and Anders Hansson. One imagines that the city has disappeared and that academics are joining forces to recreate history through documents, their imagination and the reading of maps. All this is an opening for the future and it is in this that “Atlas” can be an archeology of the future. The book was first published in Taipei in 1997, when the colony returned to China. It is a set of 51 small chapters divided into four parts. The first, “Theory”, is exciting and has been translated by the author himself. He talks about old maps and their political significance: “Mapping is not a simple set of technical exercises … maps are not … a symbol of power but the actual execution of power itself. The scramble for territorial sovereignty over places through acts of documentation has always been an alternative battlefield…between countries “(p.16). The author also points out that the stone markers or the barriers marking the frontiers do not appear before the drawing of these lines on the maps. In fact, the production of maps does not seek to retranscribe reality but declares a right of ownership and exploitation of a part of our land. Different streets and their history are evoked in the third part, while the last one analyzes the different signs, the legends of the maps, the scales, the colours, the symbols and finally the digitization. These are often small essays that add up to each other without a real progression of the narrative. As the translator tells us, it is a novel, an assemblage of facts and fiction but without intrigue or scenario. The author emphasizes that for this book he has been influenced by Italo Calvino, Borges and Barthes but recognizes only one master, Marcel Proust, to whom he has devoted his thesis. He has very little contacts with Chinese writers and rare readings but he feels close to Taiwanese novelists such as Zhang Da-Chun and Chu Tien-Wen. He often talks about objects which are sometimes under Japanese influence (cosmetics, gadgets, games …), which for some can be outdated or have disappeared. A feeling of nostalgia in these texts but with many surrealist elements that facilitate the conclusion of the story. The relationships between the characters are often created by objects that are an opportunity, a way to get closer but sometimes make these relationships difficult or impossible. These objects and the symbols they represent have different meanings for the characters who build them as myths. These objects, these myths, do not make our characters happy, most of them spend their lives fleeing or regretting. All these texts are related to Hong Kong, but it can be noted that contrary to the literature of the continent, there is no intrusion of history or politics nor value judgments. A very clinical style that analyzes precisely the characters, their personal history and especially their relations with these myths, these objects. A very lively style, very different from the essays and sometimes in a somewhat academic tone in certain chapters of “Atlas”. Interest is sustained, one is not bored and often smiles even if the conclusions are rarely positive. 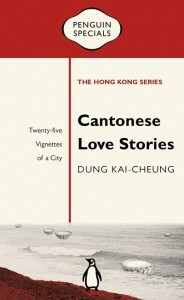 (1) Dung Kai-Cheung, “Cantonese Love Stories,” by Penguin Specials, 2017, 125 pages, by Bonnie S. MacDougall and Anders Hansson. (2) “The Clock and the Dragon”, 14 short stories from Hong Kong, translated into French by Annie Curien. Editions Caractères, 2006, 260 pages. (3) Dung Kai-Cheung, “Atlas, the Archeology of an Imaginary City”, translated by Bonnie S. MacDougall and Anders Hansson. Columbia University Press 2011, 160 pages.